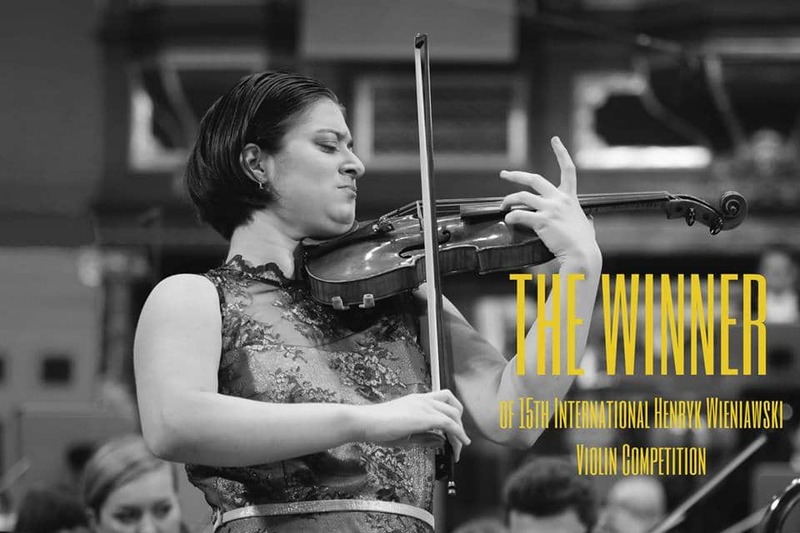 Veriko Tchumburidze, a Georgian living in Turkey, won the Wieniawski Competition in Poznan last last night. Joint second were Bomsori Kim (South Korea) and Seiji Okamoto (Japan). Fourth and fifth were Luke Hsu (USA) and Richard Lin (Taiwan/USA). The final stage was marred by an ill-tempered outburst on Polish Radio by the controversial jury member Zakhar Bron, denouncing the elimination of his pupil Mone Hattori and saying some of the finalists had given ‘disastrous’ performances in the semis. Polish media are suggesting that the result marks a severe blow for Bron’s influence in the competition industry. Veriko Tchumburidze, who is 20, has received support from the Güher-Süher Pekinels Young Musicians on World Stages project. She plays a 1756 violin made by Giambattista Guadagnini, on loan from a German foundation. Zakhar bron physically attacks Gringolts because of his students’ loss. Ok, that’s nice and I am a big fan for Turkish music education…having many friends there and playing concerts there. But just honestly: Veriko IS Georgian having at least Georgian father…as the sheer name tells. No need to deny that. I think he was trying to repeat last wieniawski competition results… I think most of his students were prize winners in that one. Veriko totally deserved it this time… She’s soo good. no words… How can a person like him speak about young musicians like this. He is a teacher, he should support the upcoming generation. Instead he publicly humiliates wonderful talented musicians. Shame on you Zahar Bron!! All of us, no matter how “high” we have climbed, technically – musically by the fruits of our own hands and hearts, either as performing artist’s or elite Artist Teacher’s, must at varying points in our Life journey’s, realise there just might be a few other’s who have God given violinistic and ‘other world’ gifts of insight and lack of self absorption enabling ‘them’ to present great Portraits in Sound in a less glitzy frame. Thanking Norman Lebrecht for the opportunity to take part in this larger than all of us Discussion and, as in present Americanise, Debate!! Now, where is His Eminence, Cardinal Timothy Dolan, of New York’s Catholic Archdiocese??!!! in an unfortunate position of making her playing the point of controversy. Like Donald Trump, he’ll accept the results….of HIS student wins. Warmest wishes to all impassioned lovers of Music and Future of Violin Playing! As Bartok said: competitions are for horses, not for musicians. No mention of the 6th and 7th place winners? Rude. a prize winner of sorts on every street corner trying to get a piece of the pie $$$$$. would be the host city Poznan due to the temporary influx of visitors. in denouncing the outcome shows the level to which this Poznan nonsense has sunk . I boom boom in pants. 2. All candidates that did not pass to the next round (there are four), may come and talk with jury members, to discuss their performance. If you wish some feedback from them, I am sure you can contact them on their facebook pages to find out more about the 2016 15th Competition. It was a tremendous success If you are not willing to get to the bottom of the “truth or false”, I could assume you are working for Mr. Lebrecht to help destroying the positive spirit of good values that are around in the world. 3. Internet is not the best source to discover new names. The quality of the performances there are downloaded on compressed files that are generalizing the sound. So, you don’t get real difference between the good and excellent. Also, you can’t judge at all about the volume and coloring of the sound. There are many more reasons. I would be glad to answers any questions you may have, by the way, are you musician? Do you play concerts? Look, I understand why you admire Kopachiskaya. There are artists you may love or hate, , but they have personality, and Patricia is one of them. I wish you a lot of joy in your life. is hell bent on destroying anything , it is your reading not mine . one would be hard pressed to accept any observations they had on the art of violin playing. C’mon Vengerov and Bron it would be laughable if it were not so ludicrous. It is deplorable that Penderecki lends his name to this nonsense. Nevertheless I also wish you the best. It’s amazing to see the vitriol towards a great teacher and musician Zakhar Born. He is entitled to his opinion as much as your all are. It’s amazing to see the vitriol towards a great teacher and musician Zakhar Born. He is entitled to his opinion as much as you all are.